The Philadelphia was patented in 1833 by Adam Ramage, of Philadelphia. Like Ramage’s earlier wooden presses (see Ramage and Ramage Foolscap), the Philadelphia was “sternly utilitarian in looks,” as Elizabeth Harris writes. The earliest Philadelphia presses had a simple elbow toggle lever, similar to that of the Wells. (After 1842 Ramage changed the toggles to resemble those on the Washington). 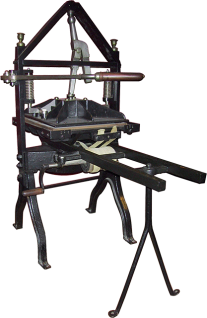 The press shown, 74 1/2″ long, was made after 1850 by Frederick Bronstrup, Ramage’s successor. The finial is missing from the top of the press.